Help yourself to a bountiful buffet, then take a seat indoors or out on the open deck with a fabulous view. Casual dining for breakfast and lunch, which can be busy. Dinner sees appetizers served buffet style, then entree brought to your table. Entrees are usually the same as are being served in one of the table service restaurants. 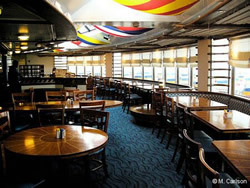 Location of the welcome aboard lunch buffet on the embarkation day. Deck 9 on the Disney Magic. Breakfast & lunch; dinner on selected nights. Casual wear. Shorts and t-shirts are fine, but no swimwear.